We are more than halfway through No Buy July – for me that means no buying of clothes. The very last thing I needed to do clothes wise was to update my sleep wear because that was anywhere from 4-6 sizes too big for present size me. 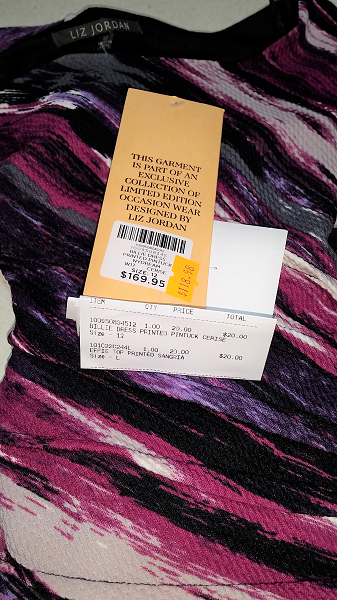 Kmart was having a clearance and on the 30th of June I picked up 4 very comfortable new nighties in size 10-12 for $5 each. YAY! I fits, I buys. 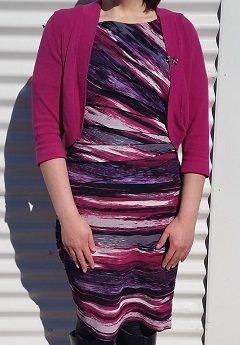 I had been wanting this dress for over 6 months, I even mentioned it here on the blog. And I got it for $20. That is CRAZY TALK I am telling you. :) The material feels amazing, it has kind of a crimp in it is the best way I can explain it. 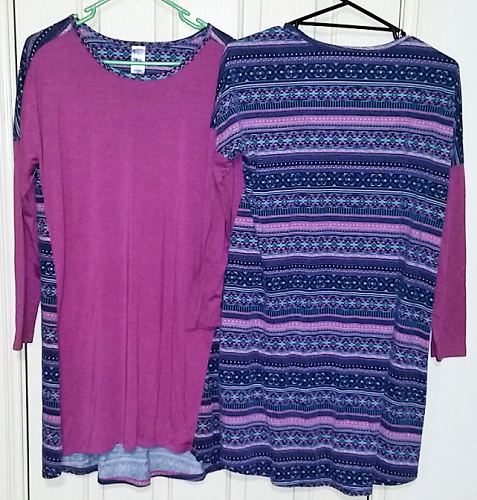 I did pick up another gorgeous top for $20 at the same time, and I pointed out my next wanted dress to The Other Half.. 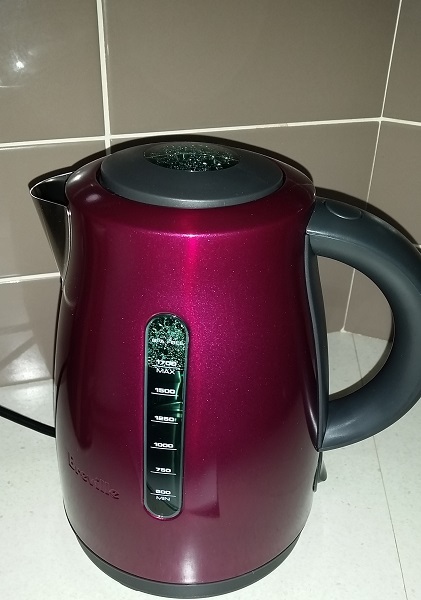 Unknown to myself, I had matched my new kettle to my upcoming new outfit. This is the Breville 1.7 litre kettle in Dragonfruit. She is a sparkly delight. We’d had our previous kettle for over 10 years and the spout was plastic and beginning to biodegrade somewhat meaning hot water would go everywhere when I tried to pour it. Very dangerous, it had to be replaced. I was worried because my Mum had bought a stainless steel kettle which is the noisiest kettle ever, you have to shout to talk over it. But this one is whisper quiet and it makes a gorgeous BING sound when it is finished boiling. I love it. 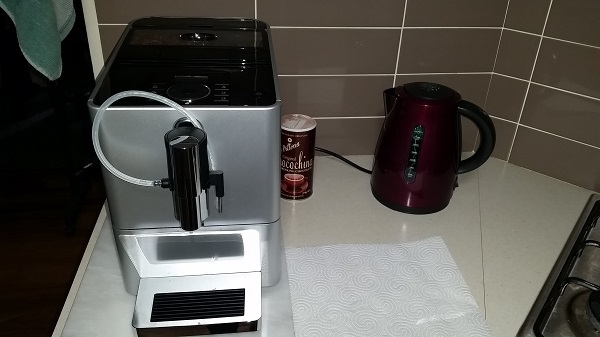 Speaking of things I love, no, I did not enjoy spending some serious cash on a new coffee machine but I love the one we’ve ended up with. We’d had the previous one for 6 years and when we did the maths, it cost us 12 cents a cup. I’d like a bit more than 6 years out of the next one, thanks appliance deities! We do use it quite a bit – 4 cups of coffee a day minimum, plus occasional extra shots for iced coffee or adding to a smoothie or milkshake. I’ve been cutting down on dairy lately because I had a bad flu which just dragged on and on. It seems to be uncooked cheddar cheese which is my main problem – if I eat it I have a stuffed up nose for the rest of the day. I figured while I was eliminating things I would give some different milks a try for coffee. The new coffee machine froths coconut milk perfectly and almond milk not quite as well but it is do-able. I am loving my coconut milk cappucinos. You get a coconut flavour as a bonus. Our afternoon coffee is accompanied with one serving of Dark Kit Kat. 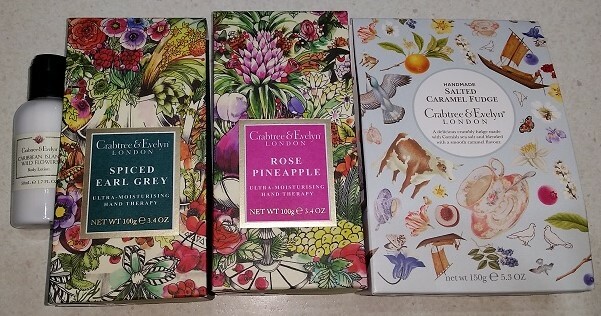 June is my birthday month and Crabtree and Evelyn were having a sale plus they sent me a $15 birthday voucher, so I grabbed a couple of hand creams and some salted caramel fudge. They did not quite bring enough salt for my liking. Rose and Pineapple hand creams smells like a toilet freshener according to the other half – it just so happens that is the one I most love. ;) I gave him the Spiced Earl Grey to try and combat his winter hands. Carribean Island Wild Flowers is super loud in a good way and the fragrance sticks around through several hand washings. TVSN were also on sale. 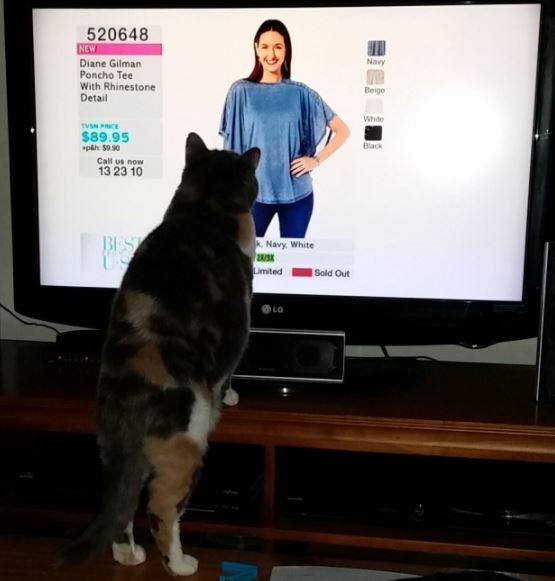 I am clearly not the only addict to this channel in the family but my biggest addiction is to their clearance pages. Grumpy suggested I buy this top. 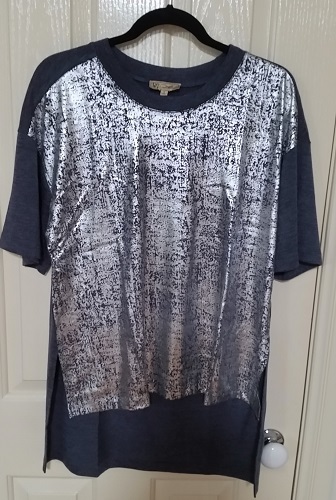 While I did not take that particular advice as I felt it was slightly up money though I may well buy it later on when it is reduced if it is still available in my size, I did purchase one Diane Gilman top which I had been watching for months in clearance that suddenly jumped down to $9.95, and one set of tops with rainbow holographic sparkly sequins. I am always impressed with the quality of the goods once I receive them. The Berry Bypass is now officially open – one lane of cars each way with a speed limit of 60km/hr. We ventured over to Berry on Saturday to check out the town minus all that traffic – seems like most other people in the world had a similar idea. We drove the bypass on Sunday on the way to Costco, it was brilliant. I LOVE that kettle and your new dress is gorgeous too. I wish I’d known K-Mart was having a sale, I need new sleep tees myself. I’ll pop in there tomorrow or Wednesday and see if there’s anything left still cheap enough. I haven’t bought Crabtree&Evelyn for ages but I think I’ll try that Caribbean hand cream. 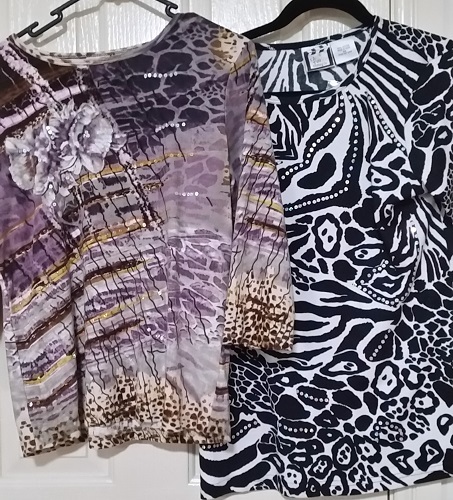 Love the new additions to your wardrobe. And that kettle!